Did you know that there are over 500 million blogs on the Internet? It’s an extremely competitive industry which requires a lot of effort to succeed at. People that have been producing content for 5 or 10 years will definitely be ranking much higher than those who are just starting. Because there is a blog on almost any topic, Google has to pick the best article to show its users. But the good news is that rules have changed. It’s much more about quality than quantity these days. Today I would love to share with you my step by step guide to make sure you have a great chance of ranking in 2019. The first thing that you should always do before writing any kind of an article that you want to rank is to do keyword research. There is no point in writing content that nobody searches for. On the other hand, you also don’t want to write an article about a topic in a very competitive niche if your website is relatively new and doesn’t have much authority. If you do that, your chances to rank are slim to none. So what should you do? How do you pick the right keywords? Well, you want to pick keywords that are not very competitive and have a reasonable amount of monthly searches. If you’re going to create an article about something new that many people haven’t written about yet, then your chances will obviously increase. There are many tools that can help you find good keyword opportunities. You can use Google AdWords Keyword Planner, KwFinder or Ubersuggest. I personally prefer the last one. You need to keep in mind that none of these tools will give you 100% accurate results. But you will have a sense of what keywords you need to target. So let’s say that your blog is about teaching people how to become a digital marketer. 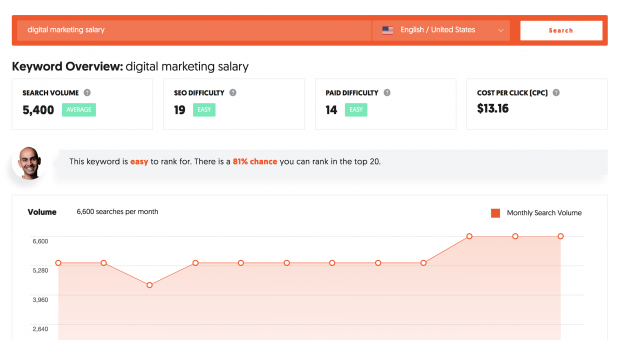 And the article you want to write is going to be about a salary of a digital marketer in the US. 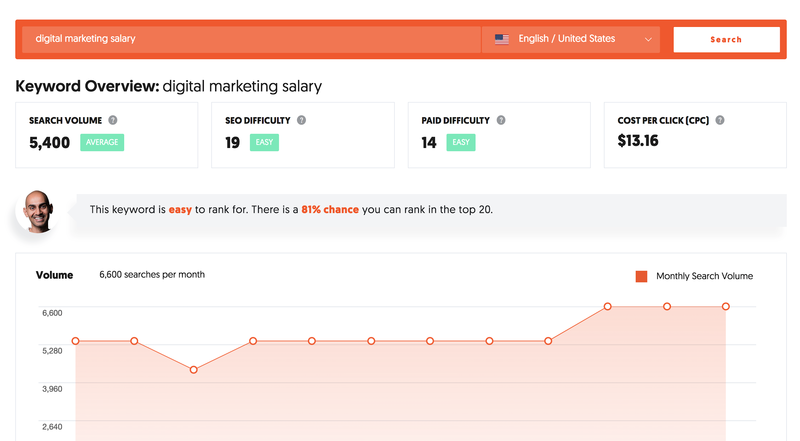 If you type “digital marketing salary” into Ubersuggest, you’ll see that SEO difficulty is easy, the search volume is relatively high and the cost per click is also high. This means that this keyword is absolutely worth going after and you’ll have a good chance to rank for it organically. You might also want to explore some similar and longer versions of the same keyword and include them in your post. This way you’ll be able to rank for multiple keywords. Once you know what keywords to target, you need to create an outline of your article. This is extremely important. You want to make sure that your content is very detailed and answers the most important questions that your visitors might have. According to Backlinko: “Long-form content gets an average of 77.2% more links than short articles”. If you don’t know how to come up with a list like that, do your research. Go to forums, Facebook and LinkedIn groups, and even blogs to see what people are interested in. Once you have a good outline, it will be so much easier for you to write the article. And another cool part about long form detailed content is that you’ll naturally include your targeted keywords multiple times. Step 3 is probably the most important one. This is how you actually rank in 2019: you write an amazing and thorough article on a topic that people love reading and sharing. First of all, it has to be helpful. Give people actionable steps that they can take, help them understand the problem better and empathize with them. This is how you become more valuable and ‘hook’ people in. Secondly, write in a conversational tone. Keep your sentences short and precise. Ask questions in the article. Make it feel like a dialogue. And last but not least – make your content shareable. Add relevant charts, infographics and even videos to help illustrate your point. Also, make sure that you have social share buttons. If possible, make them visible at all times as people scroll down while reading your post. So you have written your magic piece of content. What do you do next? Well, you have to promote it as much as you can. First of all, share it on all of your social media accounts, especially Twitter, Facebook and LinkedIn. Use relevant hashtags so people can find it. Write a good caption that evokes curiosity. Create an appealing thumbnail for your post. Make sure that your website implements Open Graph and Twitter Cards Markup. This will ensure that once you share your article on Twitter, Facebook or LinkedIn, the correct article title, description and thumbnail will show up. If you have mentioned or linked to another blog’s article, email them and let them know about it. Ask them to share your content if they like it. Another strategy is to take a look at similar competitive articles and find people that link to them. You can use Ahrefs or any other SEO tool that you like to find backlinks. Then contact people who link to your competitors and let them know why your article is better and why they should link to it. It’s a grind, but if you send 100 emails, you might get 3-5 links. Not only will those links help boost your article rankings, but you’ll also get some referral traffic from those websites. If you have enough money, you can also promote your article on social media. It’s unlikely that you’ll get more backlinks, but more traffic and social shares are highly probable. The last thing that you should do is keep building your brand online. This has become especially important if you’re in the health niche after Google’s Medic Update. If you truly want to rank #1 in a competitive industry, this is what will help you get from page 2 to page 1. Google really pays attention to brand signals. If people are searching your company or personal name a lot, this tells Google that people want to see your content. Besides that, it also means that you’re an authority in your space. This is why branding is becoming increasingly important in the SEO game. As you have probably concluded from this article, ranking #1 in 2019 is difficult but not impossible. It’s a long game that will require a lot of effort on your side. But as long as you create amazing content, promote it and don’t use any black hat techniques, you shouldn’t be afraid of any of Google’s updates. The post SEO in 2019: How to Ensure Your Content Gets Ranked appeared first on SiteProNews.